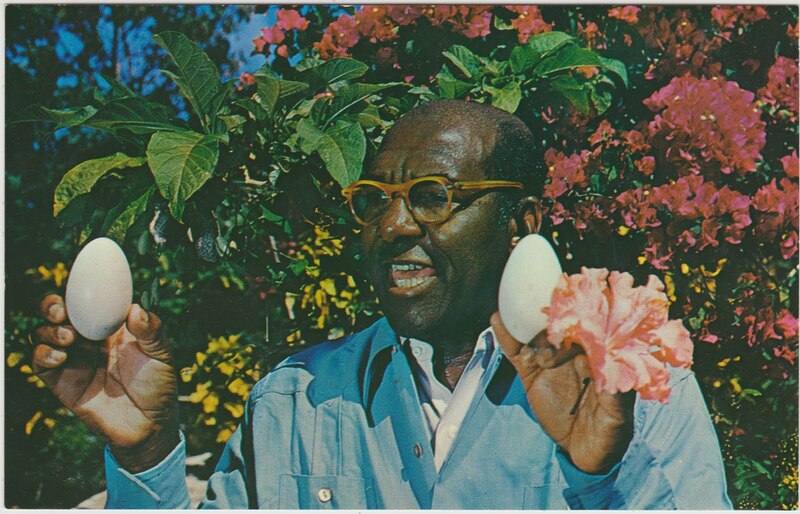 Ardastra Gardens' owner Hedley Edwards displays eggs of Flamingo. Printed by Transcolor Corp., 527 Lexington Ave., New York 17, N.Y.
"The Ardastra Gardens include an extensive array of exotic flowers and birds. ... The garden includes 'The Tree of Life', The Lignum Vitae, which is also the national flower of Jamaica, and Banyans, which are the national trees of the Bahamas. Ardastra Gardens Zoo and Conservation Center is a place where pink flamingos can be found and gnarled vines abound. It is an oasis of coconut trees, surrounded by wild orchids, hibiscus and bougainvillea blooms." Ardastra Gardens now has about 300 animals and is best known for its flamingos. Edwards perfected the process of "training" the pink birds to behave around humans in the 1950s. He also trained them to march to his spoken commands, according to the caption on this 1973 photo of Edwards and his birds from Corbis Images. GERRI MAJOR'S SOCIETYCOCKTAIL CHIT CHAT: The on-again marriage of New York private school owner Mildred Johnson Edwards2 and Nassau owner of The Bahamas' famous Ardastra Gardens, Hedley Edwards, is off-again. Said the trainer of the world-renowned performing flamingos: "Marriage may be strictly for the birds." 1. For more photographic history of The Bahamas, check out the "Old Bahamas in Photos and Postcards" website. 2. The Jet article refers to her as "Mildred Johnson Hedley," but that must be an error.